Both sides missed decent opportunities, but a draw was a fair reflection of an evenly fought contest. 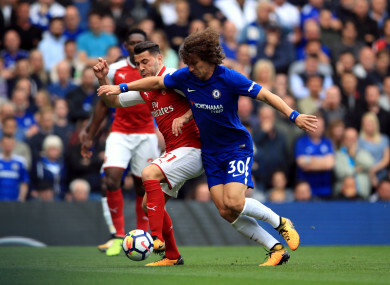 Chelsea's David Luiz (right) and Arsenal's Sead Kolasinac battle for the ball. Email “David Luiz sent off, as disciplined Arsenal hold Chelsea”. Feedback on “David Luiz sent off, as disciplined Arsenal hold Chelsea”.